Now here is a very creative and fun way of using old technology (i.e. an old fashioned piano) in a new, innovative way by utilizing new technology. This hit our radar because our team at Code Micro specializes in selling computer parts online and thus we are passionate about using old technologies for new applications. What (or who) is Stanley? 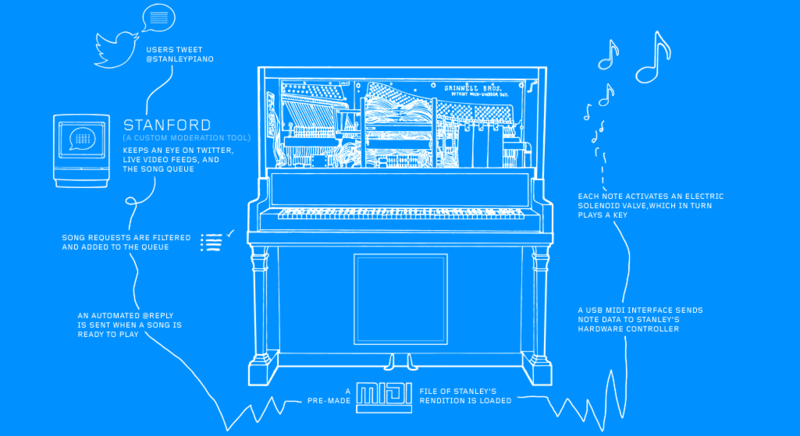 Stanley is a player piano that takes requests via Twitter. Check it out and try it for yourself. Also make sure to click on the “how it works” link, this is very cool. This is also a great segue to the series of product spotlights we will begin here on our blog (we will also Tweet and post Facebook), in which our team at Code Micro reviews discontinued computer parts and we will take a look at the innovative ways IT pros and geeks use replacement computer parts to maintain and prolong the life of IT gear. Stay tuned! And kudos to the geeks at StanleyPiano.com for making Stanley come alive! Oceanside, CA (July 23, 2012) – Code Micro, Inc., a leading provider of computer parts online, is offering new and used hard-to-find Information Technology (IT) products and replacement parts. Code Micro, Inc. is the top provider of IT products and services in Oceanside, California. Since 1994, they have been committed to providing rare, high quality computer parts and other IT products from the top manufacturers in the industry. They maintain a huge product inventory that includes over 1.6 million products of various types and from different brands. specializing in computer replacements parts online since 1994. Code Micro is recognized in the industry for their huge assortment of new and used computer parts and other IT products. The products they offer include server motherboards, computer hard drives, LCD screens and monitors, external and internal drives, computer storage systems, and memory upgrades. They also cater to customers hoping to buy various computer parts wholesale. Code Micro carries some of the most popular brands in the IT industry. They offer Dell computer parts as well as rare units from Gateway, Acer, HP, IBM, Lenovo, Panasonic, Lexmark, and Cisco, among others. Customers looking for Dell computer parts and similar products may also choose to purchase high quality refurbished equipment from Code Micro. For every purchase of refurbished equipment, the company gives part of the sale to the Arbor Day Foundation, a charity that they support. To learn more about the products and services that Code Micro offers, visit http://www.CodeMicro.com today! Place an order for computer parts online via their website or call them toll-free at 1-866-419-6615 for more information. Code Micro, Inc. is a leading provider of Information Technology (IT) products and services. They specialize in hard-to-find computer products and replacement parts. Since 1994, they have been providing high quality computer parts and products combined with excellent customer service. They also sell computer parts at wholesale prices. Visit www.codemicro.com today to find out more! Our team at Code Micro was awarded a coveted spot on the San Diego Business Journal Top 100 Fastest growing business. The award ceremony was this past July 12 on Paradise Island in Mission Bay, San Diego. A shout-out and congratulations to all team members at codemicro.com for making this award possible! And of course a big ‘thank you’ to all our loyal customers, IT pros and geeks, for making this all happen, we couldn’t have done it without you. It is our honor and passion to be able to work with and serve you, providing quality refurbished computer parts worldwide. Among all the components in a desktop computer setup the motherboard is probably the most essential. It consists of a large, flat circuit board inside the computer to which all the other parts are connected. Think of it as the heart of the computer, as it gives life to all the other components of the machine. The ports and sockets in a motherboard allow peripheral devices such as the keyboard and mouse and output devices like monitors and printers to communicate with the system. Principally it houses the microprocessor which is regarded as the brain of the computer. For any component to work, it has to connect to the motherboard so it can communicate with the system. Unlike the components of laptop computers, most desktop motherboards share the same dimensions—one can name the type of motherboard simply by analyzing the form factor of the circuit board. What factors should one consider when thinking of buying a motherboard for a desktop computer? You cannot simply buy a new motherboard and stuff it into the computer casing expecting it to work as flawlessly as the original one. To get the most out of the motherboard you plan to buy you must be familiar with the different components of a motherboard. Knowledge of the working parts of the motherboard will allow you to find hardware that is compatible with your current setup. There are two main parts in the motherboards classified according to immovability. For instance, Dell motherboards have “onboard” parts soldered directly into the circuit board. These also include integrated components such as microchips and sockets. Then there are plug-in components that can be detached at will and designed to allow upgrades of personalized Dell parts and components. There are instances where plugins are so popular that newer motherboard iterations have fully integrated them in the design. Some companies manufacture motherboards for home use, sporting only the most essential ports. Others, like the Dell PowerEdge motherboard, are tailored for enterprise-grade machines that can do billions of instructions per second. Thus it is best to ascertain that your machine is compatible with the motherboard you have eyed for a while. Practice the helpful habit of checking official documents on the Internet for next-generation models of the same motherboard brand. For instance, the PowerEdge motherboards mentioned earlier are only compatible with a line of servers manufactured by Dell (also called PowerEdge). Thus purchasing Dell computer parts would not work on a tower-mounted Lenovo ThinkServer but would function perfectly with Dell systems.